After 9 days since the last PrimeFaces Extensions release we have done a maintenance release 0.5.1. It's built on top of PrimeFaces 3.3.1. Please see releases notes. We fixed a couple of critical issues, especially in components AjaxExceptionHandler, KeyFilter and ImageAreaSelect. MasterDetail component got a new features - support of f:ajax / p:ajax and ability for disabled breadcrumb items. On the other hand, error-prone and slow-down features were removed. These are implicitly adding of MasterDetail Id to "process" attribute and implicitly navigation without pe:selectDetailLevel. Another update to be considered for migration is renaming of ResetEditableValues - pe:resetEditableValues was renamed to a short variant pe:resetInput. The showcase shows new / updated components for both last releases 0.5.0 and 0.5.1. A lot of descriptions - showcase documentation - were also improved and corrected. This release is available in the Maven central repo as usually. The work on the next release has been already started with two major re-implementations. Timeline and Layout components will be re-implemented from scratch! 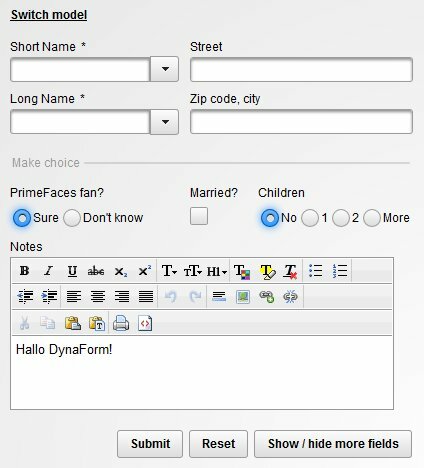 The new PrimeFaces Extensions release 0.5.0 brought a new DynaForm component. Normally, we can build a form quite straightforward by h:panelGrid oder p:panelGrid if the count of rows / columns, positions of elements, etc. are known. That's true for static forms. But it's not possible to use h:panelGrid oder p:panelGrid if a form is described dynamically, at runtime. E.g. 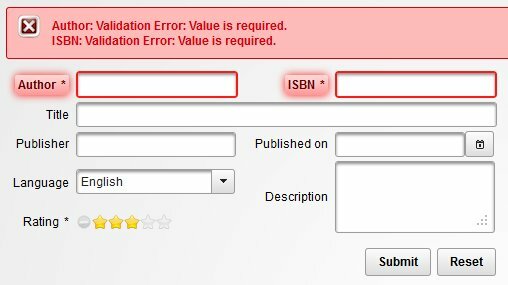 if the entire form's definition is placed in a database or a XML file. 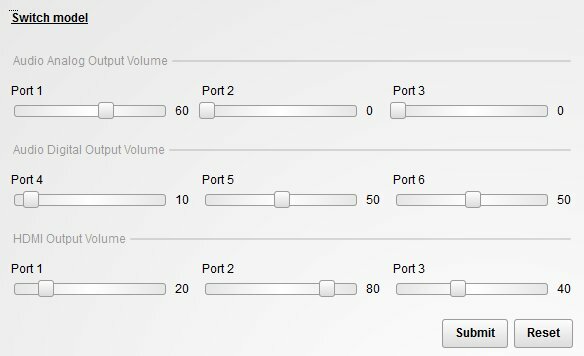 DynaForm makes possible to build a dynamic form with labels, inputs, selects and any other elements by model. There aren't limitations. Explore all its features in the showcase. Let's show how to build a simple dynamic form. The main tag is pe:dynaForm. Child tag pe:dynaFormControl matches created in Java controls by "type" attribute. This is usually a "one to many" relation. XHTML / Java (controller bean and model) code to the dynamic form above is listed below. You see that one of important features is a buil-in support for labels. DynaForm renders labels automatically - no need to write p:outputLabel. Another feature is autoSubmit flag. It allows pass form parameters in URL, build a form on page load and submit it automatically. More highlights: expandable extended view area (grid), open / close state saving, widget's client-side API, various facets. Next screenshots demonstrate how to build dynamic forms with lables above fields and various elements like PrimeFaces separator. Two forms in this example are switched by clicking on the "Switch model" link. Note, XHTML code with pe:dynaForm stays the same, only Java model gets changed. Explore the corresponding code in the use case Yet another forms. I'm pleased to announce the new release of PrimeFaces Extensions. It's fully compatible with the last PrimeFaces 3.3 release. Please see releases notes and the showcase for new / updated components and use cases. This release is available in the Maven central repo as usually. See also recently updated Getting Started for more details. We plan to deploy next releases in the cloud only. The showcase was already tested and successfully deployed on OpenShift. OpenShift provides a free JBoss 7 instance with JSF Mojarra implementation. It's not possible to change JSF impl. in the current JBoss version, so that we will stick first with Mojarra. Internal tests are running against MyFaces too (there are actually a lot of differences in both JSF impl.). Another news: in the next 4-5 months I will do less than ever activities in the PrimeFaces Extensions. I would like to concentrate fully on the upcoming PrimeFaces Cookbook. Packt publisher has very tight deadlines for chapter's delivery dates. However, I hope we can offer interesting features in the next release iteration. PrimeFaces Extensions is getting solid. Trailer. PrimeFaces Extensions project is going to be released on 9. June (Saturday). Here is a video trailer to the upcoming version. The official, detailed announcement will be published after the 0.5.0 release.